This travel size kit by Sister Sky includes: 1 oz shampoo; 1 oz conditioner; 1 oz body wash; 1 oz body lotion; and two .80 oz cleansing body bars Sweet grass is longed believed to dispel negative energy and elicit emotional strength. This purifying herb has a clean, fresh fragrance that calms and soothes. Kit comes nicely packaged in a decorative box. Sister Sky is a Native American owned company committed to creating products that embrace the beauty of indegenous cultures for the purpose of sharing herbal wisdom. Their products are inspired by nature and the wisdom of their Native American heritage. Indegenous cultures have rich and meaningful plant traditions respecting nature's own healing herbs from the Earth. Honoring this tradition, they infuse botanicals that promote well-being into their products. 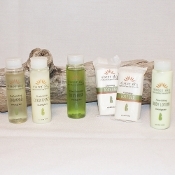 Their products are gentle and natural. Free of petro-chemicals and parabens. Never animal tested. Made in the USA.